Is a Spanish Immersion Program for me? Is a Spanish immersion program a good fit for me? A Spanish immersion program has many benefits that you have probably already heard about. "You are exposed to Spanish spoken by native speakers-- so you improve your listening skills." "You are forced to speak it, since many don't know English--you get lots of practice getting the Spanish out of your head and into your mouth." "You live and breathe Spanish in its natural cultural setting--you gain knowledge and new people skills." Here are my comments and suggestions about whether a Spanish Immersion program is a good way to go for you. If you are looking into a Spanish Immersion program because you have been studying Spanish for some time now and really want the experience of putting it into practice, such as hearing, speaking and living it in its own context, then such a program is for you. Good candidates for an immersion program are people who are good at amassing head knowledge, generally you are visual learners, and you need the kick,the push or jolt, of getting it out of the theory stage and into the practice stage. If you fit the description above, you have prepared the soil of your brain to receive the seeds of language that can now take root, grow and flourish in an immersion "green house" experience. For the adventurous, this can be a very fun experience. For the more cautious, the differences of a new culture may be a "get-out-of-your-comfort-zone" challenge. If you are a bare beginner and haven't learned basic vocabulary and grammar, I would not recommend a Spanish immersion program. Doing an immersion program is not a magic pill that will have you flowing in Spanish, especially if you are a real beginner. When I lived in Cuernavaca ,Mexico, a city which offers many Spanish immersion programs, I often met students studying there who were quite discouraged and disappointed with their learning experience, to the point of cutting their time short and just wanting to go home. What I found in common with these types of learners was they had come down with hardly any knowledge of Spanish vocabulary and how Spanish grammar works. They had high expectations about what they were going to accomplish and learn within their short stay. To try to cram in so much new learning in such a short period of time was very frustrating. They would sit through their classes and meal times with their host families, without a clue or cues as to what was going on. This is understandable since they were not previously in a Spanish class or exposed to much Spanish at all. They couldn't pick up snatches of words because they couldn't tell where the phrases started or ended. If you are going to a Spanish immersion program as a bare beginner, have realistic expectations. You can pick up basic vocabulary, and survival phrases, but don't think you'll be able to participate in a conversation in Spanish with native speakers of the language. Many times if you try to speak with your butchered Spanish, you'll end up giving the native speakers a headache. Now I'm not trying to discourage you from learning Spanish, all I'm saying is an immersion experience will be so much more beneficial if you have done some previous study in the language before you immerse yourself. 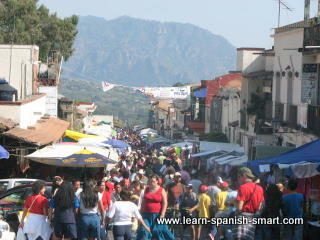 There are a multitude of Spanish immersion programs to choose from throughout Latin American and Spain. You can get an idea of the variety of schools out there and comments about them at Transitions Abroad's site. Simply put, if you choose a Spanish immersion school in Mexico, most are done in a small group settings with one teacher per group,(one on one classes can be requested at a different rate). The schools in Guatemala and further south in Central America tend to have more schools with one on one instruction. For the most part, all of the programs offer living with a host family. Sometimes these host families will have more than one student staying with them, in others you will be the only one. Also inquire if the program is aimed at your age group. The two groups you usually will see in such study programs are college aged students or retired adults. Some schools have more of a party atmosphere, particularly if near or in a medium sized city. For those with interests such as cooking, history, sight seeing etc., these activities are available after the regular classrooms hours. Those of you looking to get college credits for studying abroad, you should ask about foreign study programs first at your own school to know which programs allow you to easily transfer credit. If you find a school that you really want to go to, but it doesn't transfer credit directly to your college (but to another accredited college), you can probably do an intercollegiate credit transfer. Some of you may have friends or relatives in a certain town that has a language school you'd like to attend. You can probably arrange to live with them while studying there, since most programs have you pay separately for class study and a homestay family. I highly recommend reading over my page on being polite in Spanish before going to study in an immersion program.